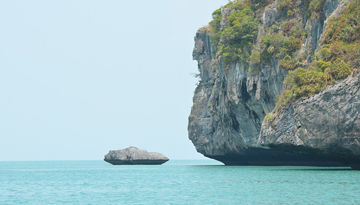 The original Thai Party Island and stepping stone to Koh Phangan, home of the full moon party. But Koh Samui has plenty more to offer than dancing by the light of the moon or buckets of alcohol on the beach. Koh Samui is a relatively new discovery to the tourist industry, up until the late 1970’s the island was very much isolated from the rest of Thailand, with a self-sufficient community of fishermen and coconut plantation owners and very little infrastructure. Nowadays the island has a booming tourist industry with plenty of beach resorts and idyllic retreats. The unimposing airport of Koh Samui gives you the feeling you have arrived in paradise, small beach hut type buildings house the departures and arrivals halls and the waiting areas are decked out like a 5 star hotel lobby with comfortable seating, plans for expansion are underway which is a shame as the airport will lose its intimate feel, but as the island grows more and more popular so increases the number of tourists that flock to the island. The larger more popular resorts of Chaweng and Bo Phut have grown due to their proximity to the Airport, with large hotels and plenty of bars and restaurants along the beach roads, step away from the beach roads and you will find a number of markets with the usual “designer goods” on offer and street food stalls that sell tasty local snacks. The island still retains some of its original Thai charm in some of the more distant resorts from the airport, where you can still find traditional Thai beach huts made of bamboo with straw roofs, quiet beaches and small family run bars and restaurants that give a very warm welcome. The months of February and March are high season, when the weather is at its best with very little rainfall and scorching hot sunny days, but for cheaper flights and hotel rates August and September are the best times to visit, just before the monsoon season kicks in, it’s still very hot during these months and there is a likelihood of rain but normally just a shower that finishes as quick as it starts. 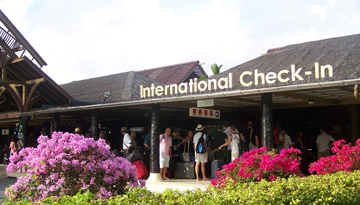 Ebookers offers Singapore Airlines flights tickets to Koh Samui from London - at £584. Book Now ! 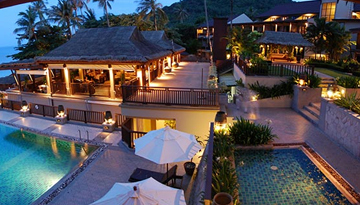 Fly from London - Koh Samui & Stay for 6 nights with 4 star accommodation. Room Only.